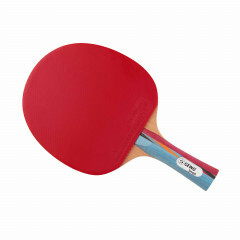 For your first steps in competitive table tennis. Complete bat with good playing features thanks to well-balanced all-round rubbers. High-quality materials for reliability in any situation. Competitive material right from the beginning, with high-quality Junior rubbers. Light and easy to play thanks to special children handles. Provided with 2,0 mm rubbers on both sides. Gewo Bats Smash is beeing added to cart.